MANILA, Philippines - A senator is pushing for the passage of a bill that seeks to increase the salary of public school teachers in elementary and secondary schools. "As we celebrate our teachers' role in the society and nation building--most especially as molders of our children's future--we should also give priority to the welfare of our hardworking teachers," said Senator Sonny Angara, a known advocate of educational reforms. Senate Bill 61 aims to upgrade the minimum salary grade level of teachers from SG 11 to 19, nearly doubling their current monthly base pay from P18,549 to P33,859. 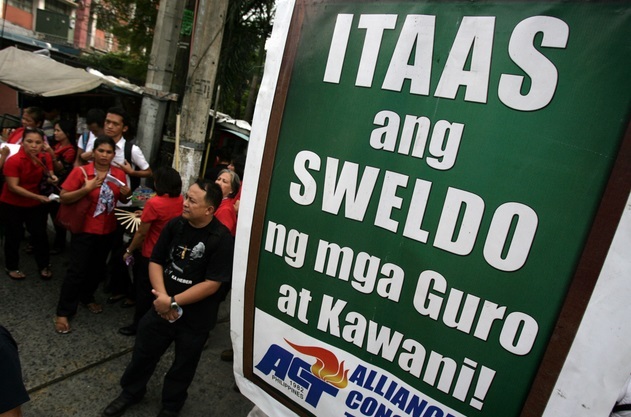 Angara, during his days as congressman, was also one of the authors of the Salary Standardization Law III which raised the salary of public school teachers in 2012. "Teachers are a special breed and to teach is a special calling. One writer once said, 'Students are actually better off in a bad school with an excellent teacher, than in excellent school with a bad teacher,'" he said in an event in celebration of the National Teachers' Month. The senator has also filed a bill that seeks to provide grants and scholarship with return of service agreements to academic and non-academic personnel to upgrade their qualification through masteral, doctoral or post-graduate studies. The lawmaker pointed out that there is a need to retrain teachers to meet the instructional aptitude needed to teach an entirely new curriculum provided under the K-to-12 program. The scholarships and grants will also attract new teachers and researchers to the higher education sector, he added. "I think every teacher realizes deep in their heart that they are not doing this for personal glory or for personal riches but definitely, to leave a legacy. Ito ang nagiisang propesyon kung saan nasusukat ang kanilang tagumpay sa tagumpay ng iba," Angara said.